Blogged by Johri: Pimples and marks gone with Garnier Pure Active Neem Face Wash! Pimples and marks gone with Garnier Pure Active Neem Face Wash! I love my skin – pure, fresh, smooth and silky and so always try to keep my skin clean and away from dirt, bacteria etc. which fills me with full of confidence in my behaviour, delivery of thoughts and in communication skills as I am associated with a profession where I have to look beautiful and charming as I meet many people in my day to day activities. But one day I was shocked when I noticed pimples on my skin. "OMG! yeh mere chehre ko kya ho gaya?" ( what happened to my face) was first thought which came to my mind and I started crying. How I will face entire world and how I will explain to them what has happened to my beautiful and charming face ? I was really shattered by all these sad feelings and so stayed in the house for entire day. I did not go outside. I could not collect the courage to face the outside world with my face full of pimples. Many ideas came to my mind to combat this problem but in vain and then the real solution to my problem was there in front of my eyes. I saw a beautiful lady with a face with beauty and charm, then her face full of pimples and finally her beautiful and charming face back !!!!!! All this was being advertised on the Television. Garnier Pure Active Neem Face Wash was the one that had brought the lady suffering from pimples on her face back to her normal glory. Her face was once again glowing and clear of all pimples and marks! I was over joyed and managed to coax my younger brother to go and buy one pack of Garnier Pure Active Neem Face Wash for me. When I applied it on my face, I was confident like that lady on the Television that I would again be blessed with my natural face having the original charm, beauty and freshness and my pimples would vanish very soon with 3 actions of Garnier Pure Active Neem Face Wash.
1. Fights bacteria: Washes away problem causing bacteria to help prevent pimples. 2. Fights pollution: Deep cleans pores to remove impurities caused by pollution. 3. Removes oil: It washes away excess oil which can attract dirt, germs and bacteria. I used Garnier Pure Active Neem Face Wash regularly for a few days and was soon rid of the pimples on my face. I have never looked back since and still use this product everyday. It has become a part of my everyday regime and I am so happy that I tried it. 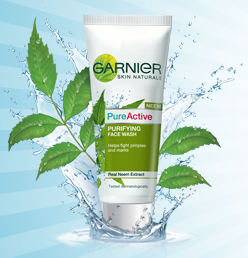 Have you tried Garnier Pure Active Neem Face Wash? If not, then dont wait any longer. Go get yourself a pack and try it. You are sure to see the difference in you face. Thanks Garnier Pure Active Neem Face Wash for making my face free of pimples and making it so clean and soft. I am now more confident and happy because of you. PS: All the opinions expressed above are my own and in no way influenced.